As your dog ages, many of his basic needs, from diet to exercise, will begin to change. This guide will help you understand what it takes to keep your senior dog happy and healthy. Dogs are very good at hiding their health problems and as an owner, it’s your responsibility to keep an eye on your senior dog to ensure that you are adjusting his routine to match changes in his body and immune system that make him less able to cope with physical and environmental stresses. Routine exams, preventive medicine and adjustments to your dog’s lifestyle can help your pooch stay healthy even as the years creep up. Different sized dogs age at varying rates, with larger dogs reaching senior status much sooner than smaller dogs. While each dog reaches “seniorhood” at a different age, most canines become seniors between 7 and 10 years old. It’s important to know your dog’s age, so you know when he becomes a senior. Ask your vet about when your dog’s needs may begin to change. Recognize and control your pup’s health risks. During a typical wellness exam, your vet will ask a variety of health-related questions in order to build a snapshot of your dog’s medical history. These questions often focus on your pup’s regular behaviors and whether you’ve observed any recent changes that may indicate a developing health concern. During this checkup, vets typically check a dog’s body for tumors, signs of pain, or arthritis. In addition, your vet will assess your dog’s overall appearance and body condition, scanning his eyes, ears, nose, and mouth for irregularities as well as listening to his lungs and heart. A routine checkup may also include the following battery of diagnostic tests. Most veterinarians agree that these baseline laboratory tests should be performed at least once a year in adult dogs ages two to seven years old, and more frequently in senior dogs. These baseline screenings allow your vet to monitor any developing trends in your dog’s health status as it changes from year to year. Additional testing may be necessary if your dog has any ongoing health issues, or if these routine screenings uncover any unusual results. 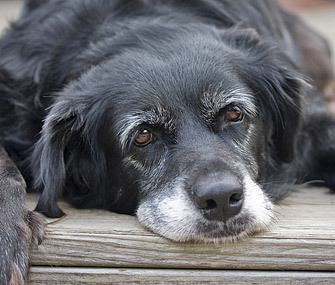 Many of the illnesses that commonly plague senior dogs are obvious even to the untrained eye. So it’s important that you monitor changes in your dog’s health between regular vet visits. If any of the following signs present themselves, contact your vet immediately. Unexplained fluctuations in your dog’s weight may be an early sign of an underlying disease. Weight management itself can be a huge factor in your dog’s health. Obesity in dogs increases the risk of developing arthritis and a number of other diseases. Along with being more watchful over your senior dog’s health, it’s crucial that you keep up with routine preventive care such as parasite prevention, dental care, vaccinations, and nutritional management. As your dog’s immune system weakens, the importance of routine basic care only increases. Create a comfortable environment for your aging best friend with easy access to food, supportive bedding, and fresh water whenever he needs it. In addition, plenty of regular attention and affection is good for morale, both yours and your senior dog’s. Smaller, more frequent meals are often easier on a senior dog’s digestive system. You may also want to adjust your bathroom routine, giving your dog more frequent opportunities to go outside. Older dogs can’t regulate their body temperature as well as they could in their younger days. It is important to keep your dog warm, dry, and indoors when he’s not out getting his exercise. Senior canines are also more sensitive to heat and humidity, so protect them from conditions in which they may overheat. If your dog has arthritis, he may prefer a ramp instead of walking up the stairs, extra blankets on his bed, or even a new bed designed to promote orthopedic health. If your dog suffers from vision loss, it’s a good idea to ease his anxiety by keeping floors clear of clutter. These little things add up. Plaque and tartar buildup can lead to a number of nasty health problems for your dog. Regular brushing with a specially formulated canine toothpaste can reduce the likelihood of any problems. Discuss with your vet whether your dog should come into the office for a thorough cleaning.